Sony has finally revealed its new flagship digital SLR. The Alpha 900 features a 'full-frame' (35mm film sized) CMOS sensor, containing 24.6 effective megapixels and an impressive range of features, including sensor-based image stabilisation, high resolution LCD screen and a 100% viewfinder. 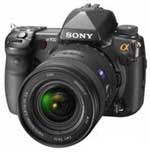 The Alpha 900 makes Sony the third DSLR manufacturer to offer a full-frame option, along with Canon and Nikon, though Sony's newcomer boasts the world's highest resolution for a 35mm type DSLR. Aimed at the professional and advanced enthusiast user, the A900 features a high-tensile aluminium and magnesium alloy body, with dust and moisture seals on all sensitive areas. Inside, Sony's Exmoor sensor performs on-chip analogue/digital conversion and noise-reduction, and dual BIONZ processors for extremely high speed operation, allowing 5 frames per second shooting at full 24MP resolution.